This compound miter saw is best known for its large and extended flip fence that raises four inches, making it possible for you to cut bigger work pieces (2 5/16 inches high and 5 21/32 inches deep) with sheer precision. Quality: Weighing only 26.3 pounds, it is light, portable, and manoeuvrable. Thumb-actuated positive miter stops let you adjust or alter miter settings to suit your preference or need. Usability: A 10-inch built-in tungsten carbide tooth saw blade makes most woodworking projects simple. It can even handle delicate and fancy styling. 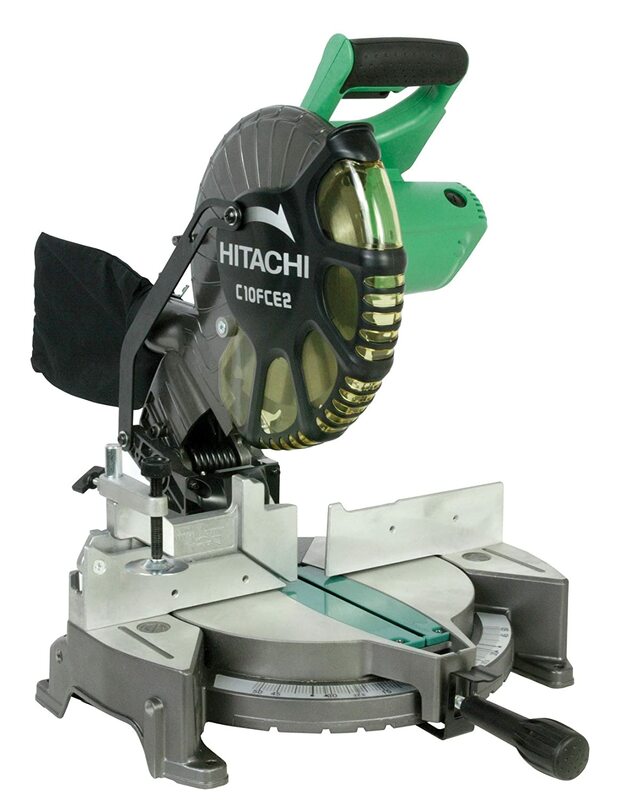 A 0-52 degree miter range makes working with the Hitachi C10FCE2 a non-complicated affair. The bevel range on the other hand is 45 degrees, enabling you to get even your first cut perfect. Performance : Because the flip fence can raise four inches, you can cut crown mouldings vertically. A no-load cutting power of 5000 rpm is quite an attractive feature. Robustness : With an elastomeric grip, the handle is not jerked by any vibrations, meaning you have a steady sturdy device to work with. The entire machine is designed with a smart centre of balance or centre of gravity to make it sit firmly and not wobble or tilt. To the left of the bevel detent plate you can adjust the bevel meter anywhere from 0-45 degrees. There are bevel stops available to increase precision. To the right and left of the miter detent plate you can adjust the miter angle range anywhere from 0-52 degrees. You have easy access to the carbon brush to help change it if required and increase the lifespan of the overall saw machine. The flip fence is extended and large. It is capable of being raised to 4 inches to help sharpen vertical crown molding angles. A horizontal handlebar is designed with an Elastomeric grip that increases both control and comfort. Being ergonomic, it provides more than adequate support during work sessions. Trim carpenters, woodworkers in general, and framers are some of the keynote professionals who have found working with the Hitachi C10FCE2 a dream. Not only is it shockingly inexpensive, this compound miter saw packs a lot more features than it is worth, making it quite the bargain. Holes in the existing fence make room for you to screw on an extra board. This veritably increases the height of the fence altogether. While you might need to trim the new added fence so the saw body can descend, accuracy is still guaranteed. In fact you also lose some cutting width in the process, but that is a small loss compared to access to better cutting angles. It all depends on the board. Use a #2 construction-grade 1×6 (5 ½ inches tall) one; even high-grade lumber or plywood works. The saw comes ready to handle most lumber and hardwood types, and framing materials. It can saw through widths of 2×6 in one pass. The 24T Hitachi stock blade is excellent for most project work. You will need a better blade for hardwood cutting but where framing lumber is concerned, the ready-attached blade works just fine. The miter stops make things very easy when altering measures. An override lock feature is ideal for miter stops. Extension bars, material clamps, and a laser system are some of the more attractive not to mention practical components you get with the Hitachi C10FCE2 product package. Some high-end saw products do not have such all-inclusive features. Some people have had trouble moving the clamp lever. Being reverse threaded, you need to turn the black handle clockwise as you see it from the rear of the machine. You can also use a 13mm wrench to take the handle off to lose it up a bit. Movement becomes easier after that. The laser is not ideal after assembling the device from the product package. You will need to align the laser and blade to either left or right and stick with that for all cuts in that session. The dust collection bag is of no great use. It demands regular emptying and cannot contain sufficient dust to help keep things ideally clean during work sessions. It has two adjustment bolts on the base of the tilt where you get to choose bevel or miter adjustments accordingly. 10- or 12-inch blade diameters make all the difference in work output. The former is lighter and more portable while the latter is heavy-set and bigger. Both bring superb efficiency depending on the task at hand, so choose well. You have a 15-amp motor that is usually found on 12-inch miter saws. With a 10-inch blade, it can power rotations to 5000 rpm. This results in a more even cut surface and less tear-outs. Efficiency remains even when working with harder materials. With a maximum of 1950 watts of power output, you can perform some of the toughest cuts. Aside from providing outstanding quality despite being so low priced, this is one of the most affordable as well as practical power tools out there. From smooth start-ups to silent operations, the Hitachi C10FCE2 is a work-dream come true. An industry-leading five-year warranty adds appeal to this incredibly cost effective compound miter saw. The Hitachi C10FCE2 has high quality construction going into its design. You will certainly appreciate the elastomeric anti-vibration handle that imparts ideal comfort and control. A soft-start motor brings modern anti-fuss-no-disturbance practicality. In addition to being easy to use and transport for both newbie and professional craftsmen, the C10FCE2 has shown that it can be quite versatile. A single bevel design means the saw head tilts solely to the left. The table can be shifted to either direction, though. The Hitachi C10FCE2 comes equipped to deal with decorative panels, soft fiberboards, aluminum sashes, hardboards, plywood, and wood in general.